On Monday, August 21, 2017, North America will bear witness to an eclipse of the sun. The path of totality- where the moon will completely cover the sun and the sun's tenuous atmosphere- is a diagonal line which spans across fourteen states from Lincoln Beach, Oregon to Charleston, South Carolina. Observers outside this path will still see a partial solar eclipse. The celestial event of a solar eclipse has not been witnessed from the contiguous United States since 1979, thirty-eight years ago. Since then, a substantial and increasing portion of our energy has been produced through solar power. In fact, in 2016, about 1% of U.S. electricity generation was produced through solar energy. So, what happens when a 70-mile wide shadow is cast across the US for over an hour? The answer has grid operators and power market experts preparing for over 9,000 megawatts of solar power to go down. This amount is roughly equal to the output of nine nuclear power plants, or enough energy to power about 7 million homes. 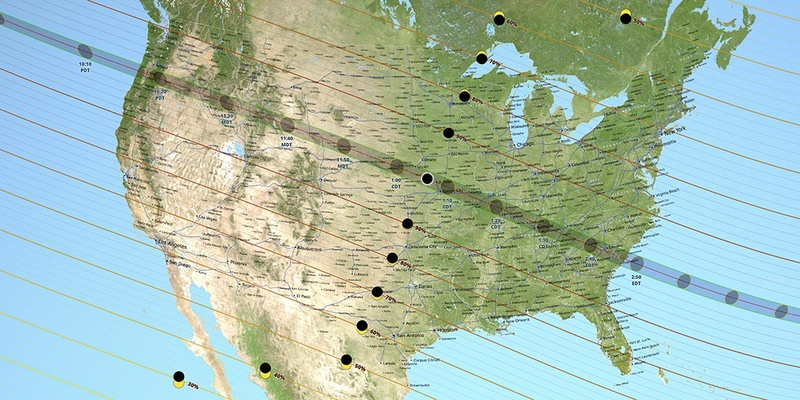 In states like California with over 18,000MW of solar capacity on line in 2016, the solar eclipse will have a greater effect than simply dazzling observers—it may affect the state’s ability to meet power demands. On some days, California meets about 40 percent of the state’s demand through solar generation. Grid operators have forecasted that the California market will need to fill a gap of about 6,000 megawatts, to account for the dimming solar radiation as the moon succinctly crosses in between the sun and the earth. The rapid decline and increase in energy may also spell trouble for grid resiliency, as generation from large solar farms may plunge by 70 megawatts per minute over a nearly 90-minute period, and then begin surging 90 megawatts per minute as the sun re-emerges. While the Northeast will experience only a partial eclipse (about 65%), if it’s a sunny day, ISO-New England expects generation from the region’s 2,000 megawatts of solar to fade for nearly three hours. The short-term loss could roughly equal the output of the 1,200-megawatt Seabrook nuclear power plant, the largest generator in New England. Texas is preparing for the eclipse to affect about 600 megawatts of solar generation. PJM Interconnection LLC, operator of the nation’s largest power grid covering parts of the eastern US, estimated the eclipse could take out as much as 2,500 megawatts of solar generation on its system, with North Carolina and New Jersey likely bearing the brunt, as solar density is greatest in these states. In fact, rooftop solar panels will account for 80 percent of the anticipated outages. So how are states and regional transmission organizations planning to deal with the anticipated energy loss? CASIO, the California Independent System Operator, will buy 200 megawatts of reserve generation from wind, natural gas and hydro resources, the agency says. ISO-New England is taking steps to prepare, as well, using sophisticated weather forecasts to plan for the period of solar irradiance. The August eclipse will serve as a test run for a larger event coming April 8, 2024, when a total eclipse is due to pass over Maine and part of northern New England. While they are infrequent, solar eclipse events highlight solar’s increasing and vital contribution to the grid. As solar continues to spread rapidly across the US and the globe, grid operators must account for celestial events in the planning process.